Kim, please email me by noon tomorrow, October 11th (the.how.to.gal@gmail.com) to claim your prize! Congratulations!! WAHOO!! So excited to win the gift card! 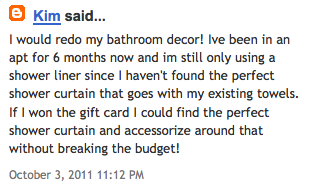 I can't wait to start redecorating my bathroom! Well..it's probably more decorating than redecorating since there was absolutely no decorating done since I moved in. The giveaway is closed, congratulations Kim!